Skilled Orland Park prenuptial agreement lawyer. Marriage is a joyful time in life. Couples preparing for their wedding do not want to think that the marriage will ever come to an end. Yet, unfortunately, statistics show that as many as 43% of marriages will result in divorce. All couples, regardless of current wealth, status, or age, may want to consider consulting with an experienced Orland Park prenuptial agreement lawyer before they wed. A prenuptial agreement will help distribute your assets should you divorce in the future. Before your wedding, consult with Johnson & Johnson, Ltd. to provide you with a prenuptial agreement. 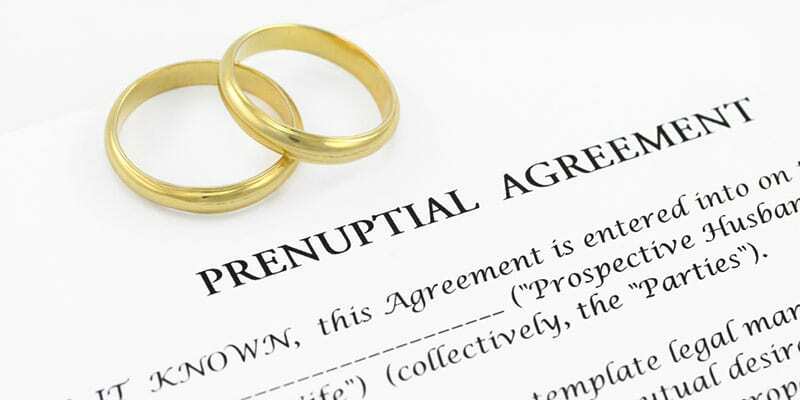 A prenuptial agreement (“prenup”) is not just for celebrities or the very wealthy. They are helpful tools for all married couples. The prenup may be compared to an insurance policy. You hope you never have to use it, but are thankful that it is in place if you need it. The purpose of the document is to designate property and asset distribution should you divorce. In Illinois, assets acquired during the marriage are considered marital property and must be divided equitably should the couple divorce. A prenup can change the way the couple splits up their property in a divorce and generally takes precedence over this rule. It is important to note that a prenuptial agreement can modify a will or estate plan so it is essential to be sure to work with a qualified Orland Park prenuptial agreement lawyer when drafting the document. Both parties want to ensure that their assets are protected in case of a divorce. While there are many standard prenup forms available, it is often best to avoid using these types of documents. They are not tailored to your unique needs and they may not offer any real protection in case of a divorce. Even worse, they could end up making things worse or more complicated – something you are trying to keep away from. Simplify the process with the help from an Orland Park prenuptial agreement lawyer. The more detailed the prenuptial agreement is, the better it will likely protect you in case of a divorce. It may include instructions on how to split up property and assets such as homes, vehicles, and home furnishings. It may also include instructions on how to handle children and pet issues in case of a divorce. Your prenuptial agreement should incorporate everything you want. The status of your relationship at the time of entering into a prenup is important. An engaged couple has a legal obligation to have fair and honest dealings with each other. The sooner you consult with an Orland Park prenuptial agreement lawyer the better. A prenuptial agreement may include one or more special provisions. One common provision is a sunset clause. This means that the prenuptial agreement expires after a specific period of time. For example, a prenup may state that the agreement is void once the marriage passes ten years. Recently, a prenup provision has been used more frequently to provide protection from negative social media after a breakup. Many special considerations may be made, based on your unique requirements. Discuss your options with an Orland Park prenuptial agreement lawyer to make sure your needs are covered. Prenuptial agreements are legal documents. As such, they must be well written and properly executed in order to provide protection. A poorly written prenuptial agreement may actually be less helpful than not having one at all. A prenup must meet specific legal requirements so it is advisable to have it made by an Orland Park prenuptial agreement lawyer with expertise in this area. Whether you require a prenuptial agreement or are trying to resolve issues with a prenup that is in place, the knowledgeable lawyers at Johnson & Johnson, Ltd. are here to help. Contact us today to set up a consultation.